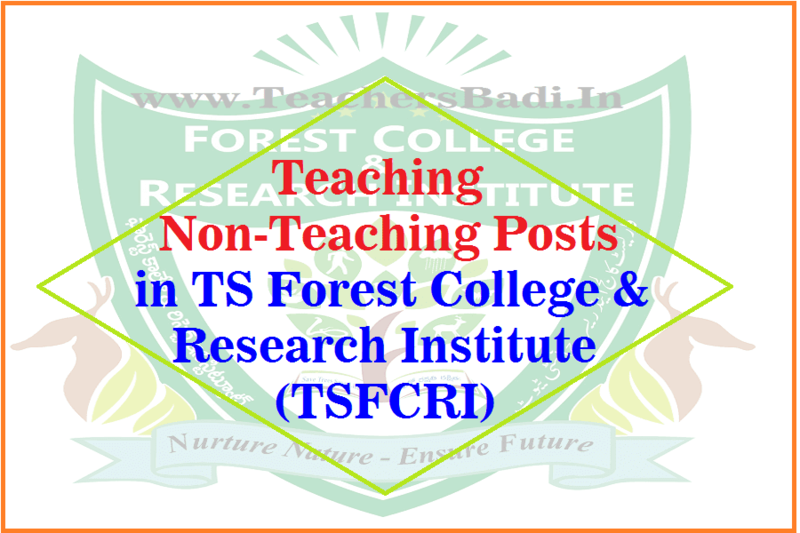 Teaching,Non-Teaching Posts in TS Forest College & Research Institute(TSFCRI): Govt of Telangana has established the Forest College & Research Institute (FCRI) in Narsampally Mulugu, Medak District(Telangana State Forest Academy) to run Forestry courses like, B.Sc/M.Sc/Ph.D Courses in Forestry at TSFCRI, Mulugu, Medak District. In this regarding, Government of Telangana, Finance Department, Environment, Forests, Science & Technology Department has sanctioned and Created (118) posts Teaching and Non-teaching staff for newly established Forest College & Research Institute (FCRI) to impart education in basic and applied Forestry to the students and also to provide research and employment opportunities on Forestry and related fields..
1. G.O.Ms.No.51, EFS&T (For.I) Department, Dt. 09.10.2015. 2. From the PCCF, Ref.No.20653/2015/Res., Dt. 16.02.2016 and even No.dt.02.03.2016 & 05.03.2016. 3. EFS&T Department, U.O.No.791/For.II(1)/2016, dt. 26.04.2016. ORDER: In the G.O. 1st read above, Government accorded administrative sanction for establishment of Forest College & Research Institute (FCRI) within the premises of existing Mulugu Forest Research Institute in Narsampally RF, Medak District, duly allocating required budget of Rs.45.79 crores towards capital expenditure and Rs.6.00 crores towards recurring expenditure. In the 2nd read above, the Principal Chief Conservator of Forests, Telangana State, Hyderabad submitted proposal for sanction of posts, both Teaching and Non-Teaching, for establishment of Forest College & Research Institute (FCRI) in Narsampally RF, Medak District to impart education in basic and applied Forestry to the students and also to provide research and employment opportunities on Forestry and related fields. Government, after careful examination of the proposal, hereby accord sanction for creation of (118) posts, both Teaching and Non-Teaching over a period of five years from 2016-17 to 2020-21 as indicated below to run the B.Sc/M.Sc/Ph.D Courses in Forestry at Forest College & Research Institute (FCRI), Mulugu, Medak District commencing from the academic year 2016-17 for imparting the Forestry Education and Research. The EFS&T Department shall obtain concurrence of Finance (HRM.I) Department before initiating measures to fill up the posts sanctioned in this order, wherever service rules prescribe direct recruitment. The EFS&T Department are requested to take necessary further action in the matter accordingly.